Christmas is a very special time for Norwegians and in many parts of the country and along the remote coastal towns it is still celebrated in a traditional way with families. All work cease on the afternoon of Christmas Eve and the family put on their finery for the occasion. Families get together to make up decorations for the Christmas tree, a rather nice tradition rather than buying commercial Christmas decorations. Christmas Eve (Julaften) is the big event for Norwegians and families gather to have their main Christmas feast and open presents on this evening. Singing Christmas carols is an important part of the Christmas traditions and for this family members join hands and walk around the Christmas tree. They make two concentric circles, and walk around the Christmas tree in opposite directions. For the superstitious, all the brooms in the house are hidden. Norwegians long ago believed that witches and mischievous spirits come out on Christmas Eve and would steal their brooms for riding. Another Christmastime superstition involves a little gnome or elf called Nisse, who guards all the farm animals. If Norwegian children do not place a bowl of special porridge for Nisse, he will play tricks them. On Christmas day after church, it is common for children to pay visits to neighbours, singing Christmas carols (Julebukk), and in return they will be given some treats. Julebukk traditions vary throughout the country. A traditional Christmas dinner for Norwegians often starts with porridge with a lucky almond hidden in it for some lucky person. Whoever finds the almond wins a prize. Traditional Christmas Norwegian food dishes vary from region to region. In Western Norway (Vestlandet), Pinnekjøtt (steamed, salted mutton ribs) is a common dish, whereas near the town of Voss, Smalahove (mutton head) is eaten. Lutefisk is another common dish, but it is losing popularity. In Northern Norway, fresh boiled cod is more common. In Eastern Norway, Svineribbe (pork rib roast) is the most common dish. Other popular dishes are turkey, rakfisk, medisterkaker and medisterpølser (dumplings and sausages made of minced pork meat). 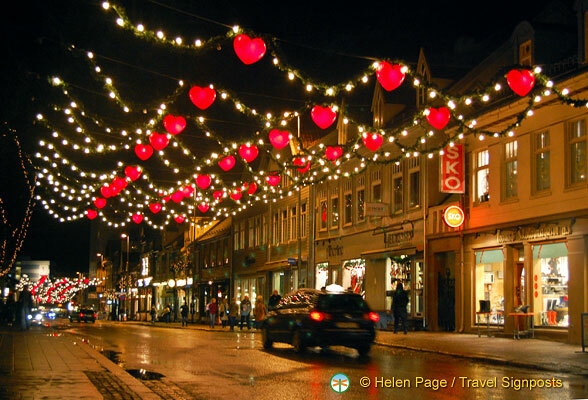 At Christmas in Norway, white lights are favoured for decorations in homes and white candles light the tree on Christmas Eve. With the whole country pretty much covered in snow, it’s a truly White Christmas in Norway. 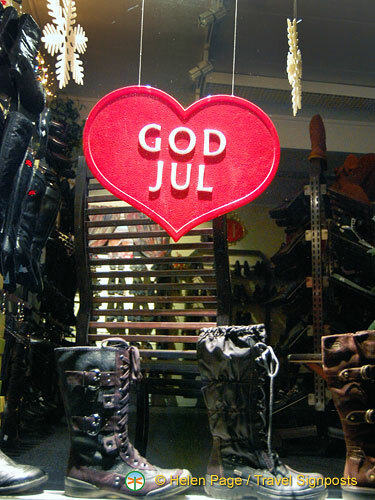 Norwegian is a pretty tough language to learn but the two words that I easily manage are God Jul! where is the top picture taken?